Ensure the air Shower correct and safe use, to ensure that their service life. Air Shower in and out of all the staff. Staff from non-clean up areas into thedoor Air Shower. 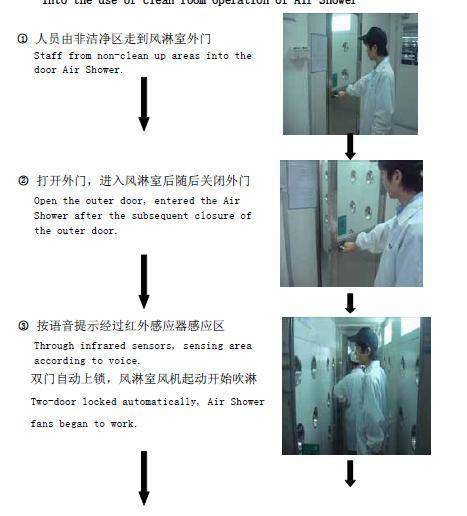 Open the outer door, entered the AirShower after the subsequent closure of the outer door. 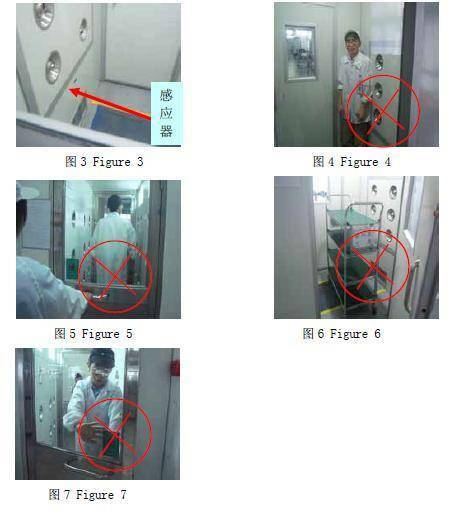 Through infrared sensors, sensing area according to voice.Two-door locked automatically, Air Shower fans began to work. Time set by the wind after the shower,according to the voice inside to open the door into the clean room. Air Shower after entering the need to close the door first and then induced to stand in the sensor area, especially the people together, and then close the door to start the air shower. Indoor Air Shower standing shower when the wind will not accept to avoid Air Shower. Can not be changed in the direction of the wind mouth. Large items such as materials cart, the cart etc. can not go in and out Air Shower (Figure 6), the need to take the other side of the door. Department of Equipment employee should be checked daily at the Air Shower operation, ifunusual, reported in a timely manner to deal with engineers.